When I was shopping for bedding I wanted something light colored and fresh looking. I wanted gray tones but I was not sure what other color I wanted. I knew I wanted lots of pillows. I love the look of beds with so many billows. When I was shopping for drapes at Big Lots...I checked out the bedding. I found exactly what I wanted. A bedding set with everything I needed. 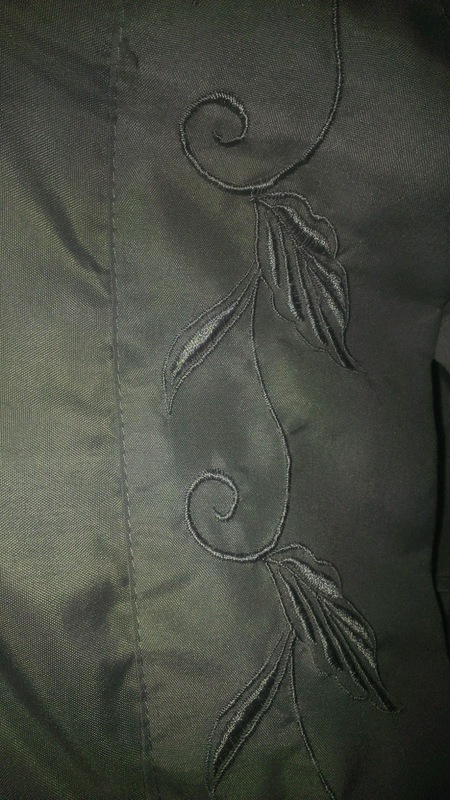 Comforter - Bed Skirt - 4 Pillow Shams and 2 Accent Pillows. The set had gray tones and the yellow/green color. PERFECT for the room and the total cost was $69.99 at Big Lots! 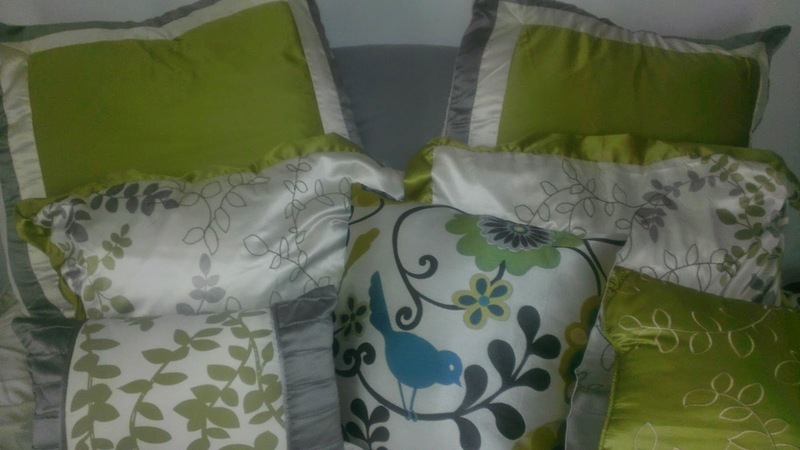 While shopping I found really nice throw pillows - with the same color scheme and a teal bird (I Love Birds). I purchased two throw pillows each with the same design but placed different on the pillow. One for the bed and one for the chair. Throw pillows cost $12.00 each - total $24.00. pillowcases and not enough pillows. Next trip to Walmart I found pillows perfect for the shams for $2.50 each - I needed 6 for shams. Two of the shams are the large square shams - they each took two pillows to make them look full. Four pillows for the pillowcases - I need a total of 8 new pillows for $20.00. 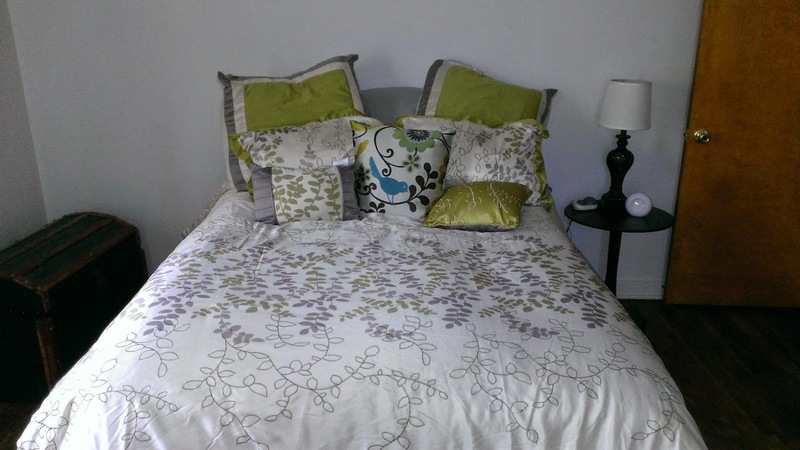 Pillows on bed = 4 regular pillowcases pillows - 2 regular shams - 2 large square shams - 2 accent pillows and 1 throw pillow! Plus a throw pillow for the chair! I love the bedding you chose and that really is a great price for everything that you got! Way to go! It is true that the quality of fiber and the stuff used in your bed sheets is directly proportional to your comfort and tension-free sleep. 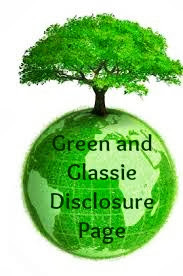 While purchasing a bed sheet, you need to ask about the fiber quality of the bed sheet. Glad you found what you want with this price. Enjoy it! And by the way, the patterns on your pillows and mattress look so lovely! Whoa... Indeed, that's not bad. You surely know how to save money on mattresses. 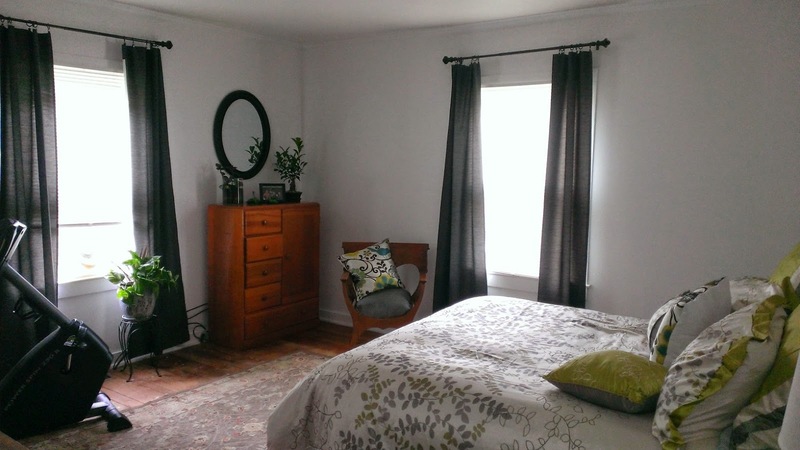 Wow, The spare bedroom looks so comfy I'm jealous. I will setup a bedroom same yours.